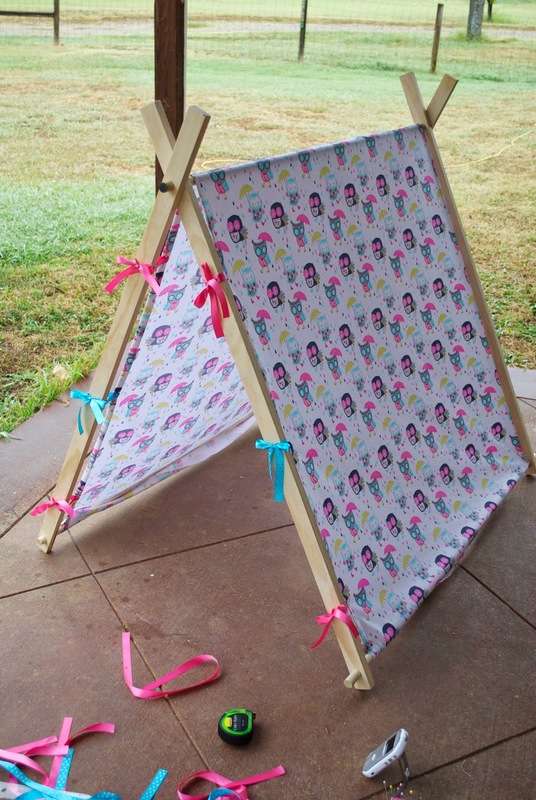 I made this little A-frame tent as Adelaide's birthday present. I had originally looked for one to buy on etsy, but these things don't come pre-made for very cheap. So, I found a tutorial on Pinterest and did it myself. 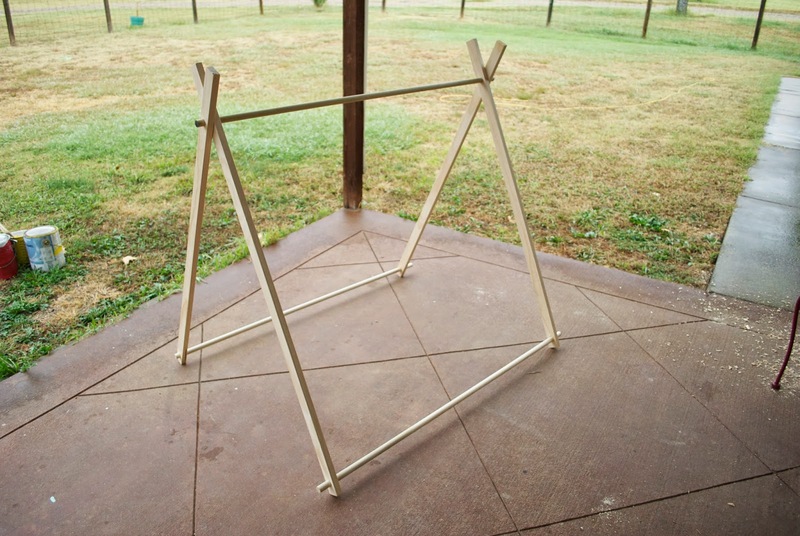 I know there's already several tutorials out there on DIY A-Frame Tents, but there's always room for one more, right? 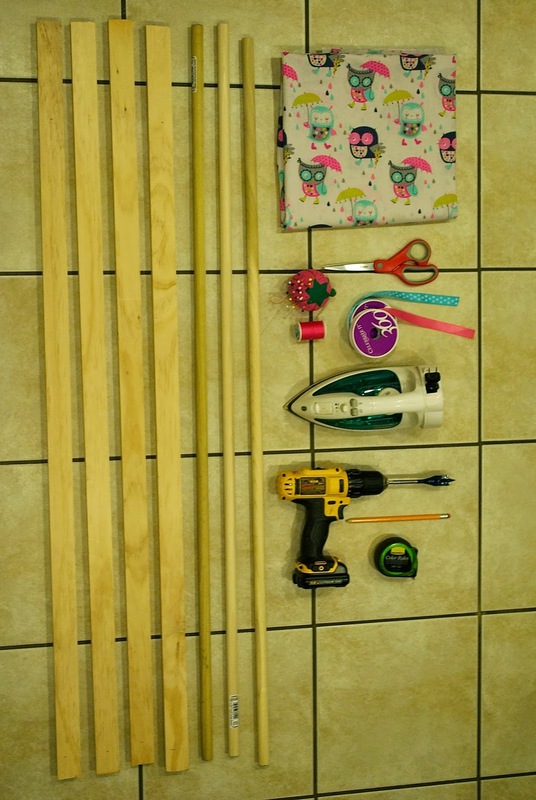 I got most of my info from this tutorial that I found on Pinterest, but also saw this one that incorporated the idea of the lower dowel, which was what I wanted to do also. To start, make a mark on your 1x2's about 6" down from the top and about 2" up from the bottom, both centered (centered-ish if you're like me) on the board. Now grab the drill and drill a hole on each mark. These holes will be where your dowels will slide through. It's an extremely tight fit if you just go straight through once. You want it to be tight, so that the tent doesn't just flop open, but I couldn't even get the dowel through a couple of the holes. What I did here was just "wallow" (don't let the technical terms throw you ;) the bit around in the hole, just a little (according to hubs, spade bits aren't great for "wallowing", but it worked fine for me to get just that little bit of room). 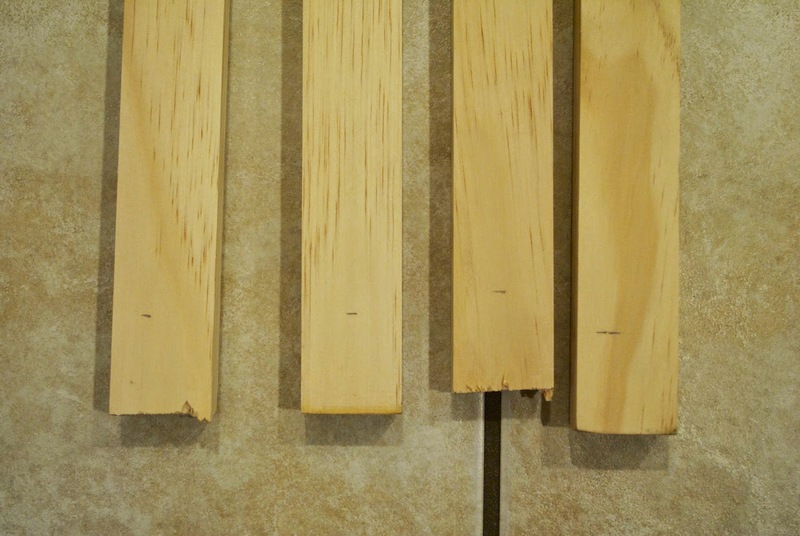 You probably noticed in the above pics that my ends weren't in great shape, thanks to the less than delicate sawing by the person helping me at Lowes (I had to buy two 8' boards and have them cut in half at the store in order to fit them in my car, because they were out of the 48" boards). So this is where the sandpaper comes in. I sanded down the ends, as well as around the holes I drilled where there were some splinters (maybe due to my less than delicate drilling?) and just a quick up and down the long edges, since I had the sandpaper out anyway. Now you're ready to put the frame together! Now comes the hardest part of the project (for me anyway). I didn't do myself any favors by buying a fabric with a directional print, which I didn't even think about that until it was actually time to start work on the cover. I would suggest buying either a solid fabric or a print that doesn't have a certain top or bottom. At this point I cut my fabric in half and then sewed it back together so that the print was facing the correct direction on both sides (of course, you could always leave it as is, and just have the print upside down on one side, I highly doubt any kid would care). I did 2 straight stitches all the way across, just to make sure it was going to be nice and strong. 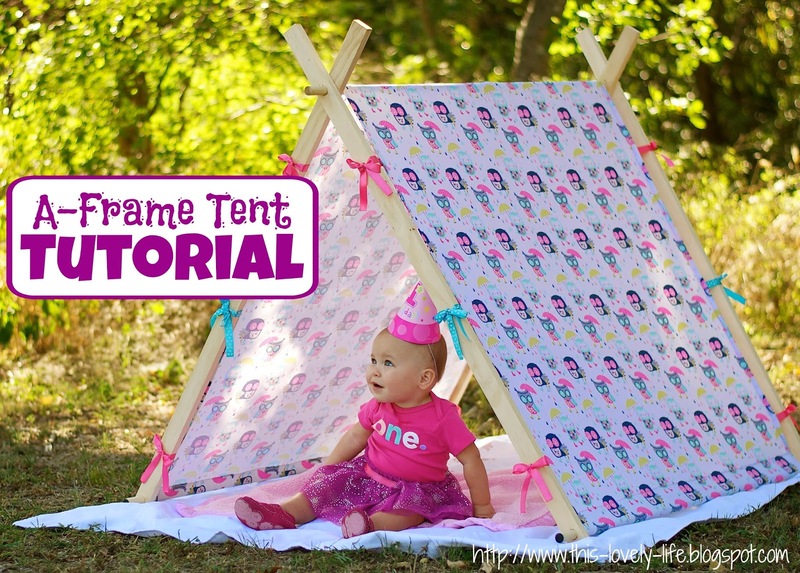 Now you can go ahead and iron down your hems on the sides (this will be the front and back edges of the tent). I folded it over twice so the raw edge wouldn't be exposed. I'd say the fold was about an inch or so wide (I'm not really a measure-er if you can't already tell). And you can go ahead and hem these edges. Again, my lack of measuring will come into play here. I took the cover out and draped it over the frame to get an idea of where I stood. It was at this point when I realized that #1, I didn't manage to cut my fabric exactly in half, as one side was several inches longer than the other, and #2, one side was going to be a very close fit around the bottom dowel. *Measuring probably would've helped a lot in this case, but try as I might, my measuring is almost always off. I swear, I will measure something exactly right, I check and double check, but at least half the time it comes out all off. So on this project I didn't even try. I went ahead and folded the fabric under the bottom dowels and pinned it in place (you're making an opening like that on a curtain for a curtain rod, in case you didn't already figure that out). I also pinned my ribbons in place. Again, I mostly just eyeballed where I wanted my ribbon to be. I went ahead and tied them and everything just to make sure they looked right. 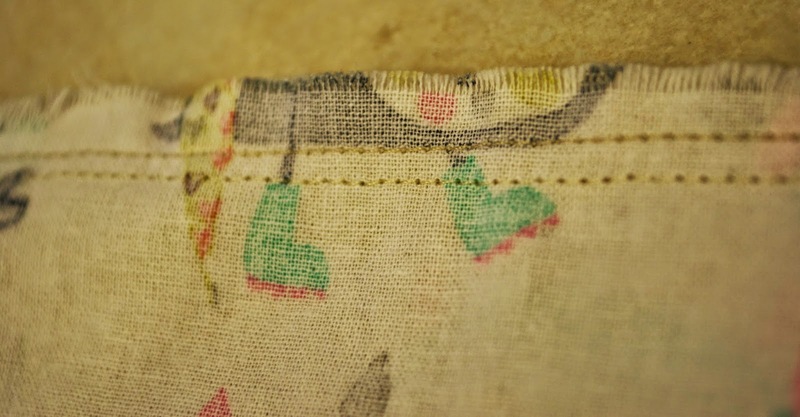 Now you can iron down your bottom hem and pin it all the way across to hold it in place. If you have enough fabric, you can fold it under a couple of times to avoid having a raw edge exposed. Or don't, I certainly won't tell (clearly I'm no professional). Now you just need to hem all the way around, right over the ribbons as you go to attach them in place. You're ready to put it all back together again! 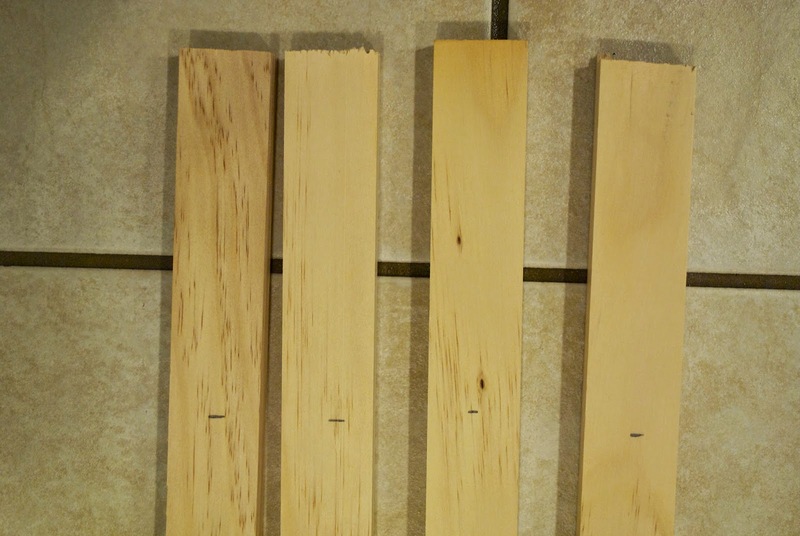 This time you do have to take those bottom dowels out and slide them through the slots you just created. Tie some cute bows and there you have it! It really was a pretty easy project (though I'm sure my tutorial made it seem difficult and/or confusing... sorry about that!). 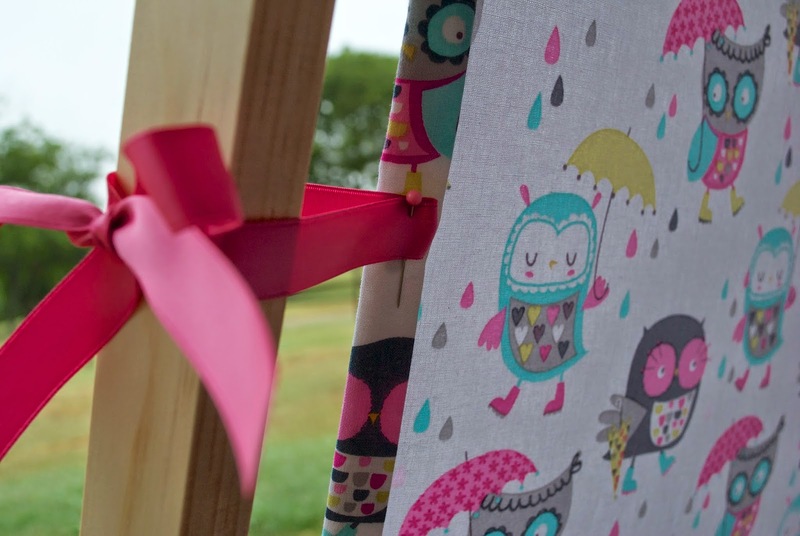 As long as you have a basic knowledge of sewing (straight lines only!) and the use of a drill, you should be good to go. 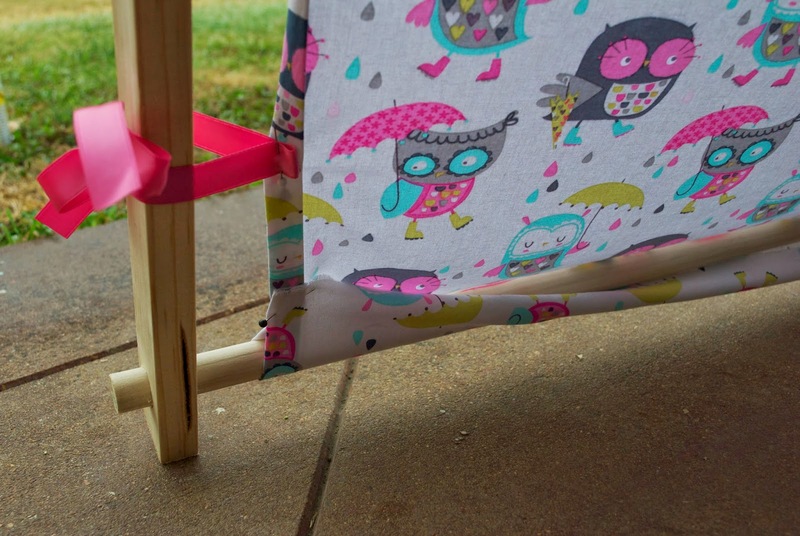 If you're not to keen on doing quite so much sewing and don't care about that bottom dowel, this tutorial makes it even easier... and the tutorial itself is far less rambley and easier to follow. Give me a break though, eh? It was my first go at any kind of tutorial. The simple fact that I even got a few pictures along the way equals a success in my book! Let me know if you decide to make one of your own, I'd love to see them! Also, I'd super-duper, reeeeaaally appreciate it if you would pin this tutorial if you decide to use it, share it with all of your Pinterest friends!